Coffee is a brewed drink made from roasted coffee beans and is nowadays unarguably of paramount importance in the lives of billions of people as emphasized by the fact that it is globally the second most consumed drink after water. Coffee was first introduced in Europe in the 16th century, although, according to legend, it was discovered in 850 AD by a goat herder in Ethiopia and subsequently spread to neighboring Arabic empires were the coffee brew rapidly gained in popularity. Coffee plants are commercially cultivated in plantations in about 70 countries, ranging from Ethiopia to Vietnam and Brazil. Coffee beans are obtained from berries from the coffee plant. Although 70 coffee plants species are known, the two most important ones are the Arabica and Robusta coffee plants. Coffee prepared from Arabica beans has a mild flavor and superior quality and aroma, while coffee from Robusta beans is characterized by a stronger and bitterer flavor. Typically, ripe coffee berries are picked, processed to remove the outer layer and dried. The beans are roasted, ground and infused with near boiling water to produce a cup of coffee. Chemically, coffee is remarkable complex and its exact composition depends on many of factors such as variety, roasting, grinding and brew conditions. The variability of coffee is underscored by a recent study which analyzed the chemical makeup of espresso coffees obtained from 20 different coffee shops in Glasgow, finding that the caffeine content ranged from 50 to 322 mg per cup (1). 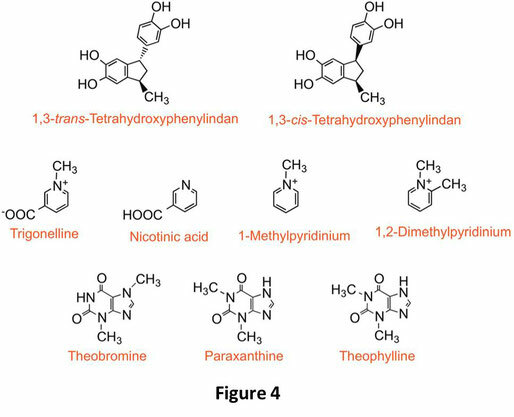 The most important chemicals in coffee are (2): chlorogenic acids, caffeine, diterpenes (cafestol and kahweol), trigonelline and melanoidins (figure 1). Coffee beans contain different (poly)phenols that together makeup 6-10% of the dry weight. 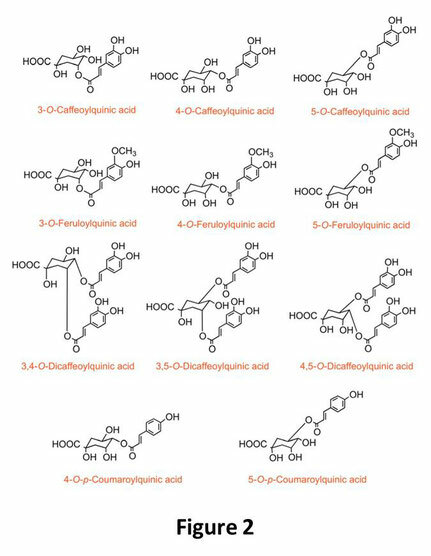 The majority of (poly)phenols are chlorogenic acids (figure 2, adapted from 2), including caffeoylquinic acids. Upon roasting, the amount of chlorogenic acids is reduced. Despite this reduction, coffee remains the richest source of dietary chlorogenic acids as a single espresso contains 24 to 423 mg of chlorogenic acids (2). Coffee is often said to possess superior antioxidant activities due to the presence of chlorogenic acids. However, the vast majority of these compounds are metabolized after coffee consumption and the plasma levels of unmetabolized chlorogenic acids are too low to make a significant contribution to the antioxidant system. Nevertheless, chlorogenic acids display bioactivity because: (i) these compounds have been implicated in modulating expression of genes required for drug detoxification, (ii) they possess anticarcinogenic activity through inhibition of DNA methyltransferase (iii) and may function as antithrombotic agent, protecting against the development of cardiovascular diseases. Moreover, it was reported that chlorogenic acids inhibit the adsorption of Streptococcus mutans (the major causative agent for human caries) onto saliva-coated surfaces, suggesting that coffee protects against S. mutans-induced tooth decay (3). Kahweol and cafestol (figure 3, adapted from reference 2) are present in coffee as fatty acyl esters and contribute to the bitter taste of a cup of coffee. These compounds are common in boiled and unfiltered coffee and can be removed by filtering. Kahweol and cafestol contribute to the adverse effects of coffee because they have been implicated in the cholesterol-raising effect of coffee, although it was also reported that these compounds exhibit anticarcinogenic activity (4). Trigonelline is a pyridine alkaloid of which the amount in green coffee is about 1% of the dry weight. This compound is partially degraded by roasting into nicotinic acid and several other pyridine derivatives (figure 4, adapted from 2). The levels of trigonelline in a cup of coffee range from 40 to 110 mg. Moreover, this compound has been shown to exhibit different biological activities, including hypoglycemic, neuroprotective and antibacterial activities. Coffee contains a substantial amount of complex non-digestible carbohydrates, such as galactomannans and arabinogalactans. The fiber content of a cup of coffee varies between 0.14 to 0.65 g. During roasting, these carbohydrates react with amino acids generating structurally diverse polymers known as melanoidins. Their exact composition is not known but these high molecular weight compounds are in general brown colored and contribute to the dark color of coffee. Several studies indicate that melanoidins exhibit different biological activities, including antimicrobial, antioxidant and the ability to influence the gut microbiome (2). The chemistry of coffee is complex because it contains hundreds of different compounds. 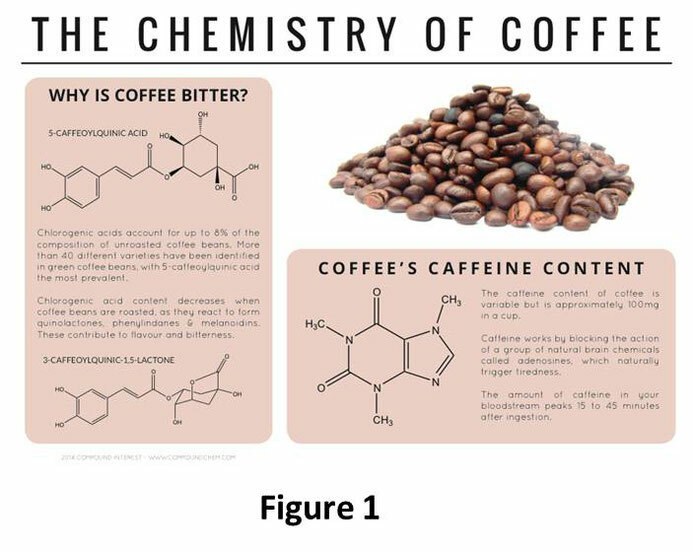 Moreover, the chemical composition depends on a variety of factors and the exact formulation of a cup of coffee will therefore be hard to establish. Although it is clear that coffee contains different bioactive compounds, its complex chemistry complicates full assessment of its physiological properties. However, the combined data from different epidemiological studies indicates that coffee lowers the risk of chronic diseases such as type 2 diabetes, cardio vascular disease, cancer (endometrial and hepatocellular cancer) and neurodegenerative diseases (i.e. Parkinson’s). More information about the beneficial effects of coffee can be found in the articles below. 1. T. W. M. Crozier, A. et al. 2012. Espresso coffees, caffeine and chlorogenic acid intake: potential health implications. Food Funct: 3, 30–33. 2. Iziar, A. et al. 2014. Coffee: biochemistry and potential impact on Health. Food Funct: 5, 1695-1717. 3. Daglia, M. et al. 2002. Anti-adhesive effect of green and roasted coffee on Streptococcus mutans' adhesive properties on saliva-coated hydroxyapatite beads. J Agric Food Chem: 50, 1225–1229. 4. Cavin, A. et al. 2002. 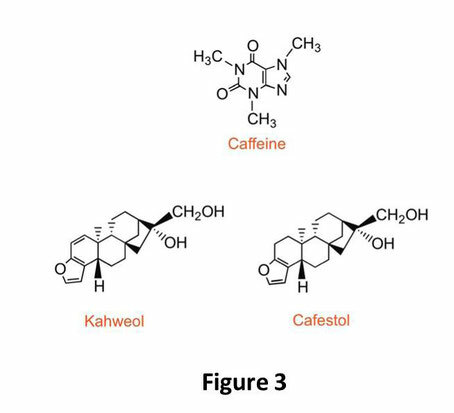 Cafestol and kahweol, two coffee specific diterpenes with anticarcinogenic activity. 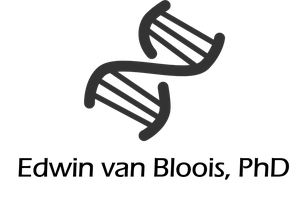 Food Chem Toxicol: 40, 1155–1163.